Fonterra is now the second largest user of coal in New Zealand, using more coal than the Huntly coal-fired power station, according to our new research (see table below). This highlights the company’s contribution to climate change and to New Zealand’s total emissions. 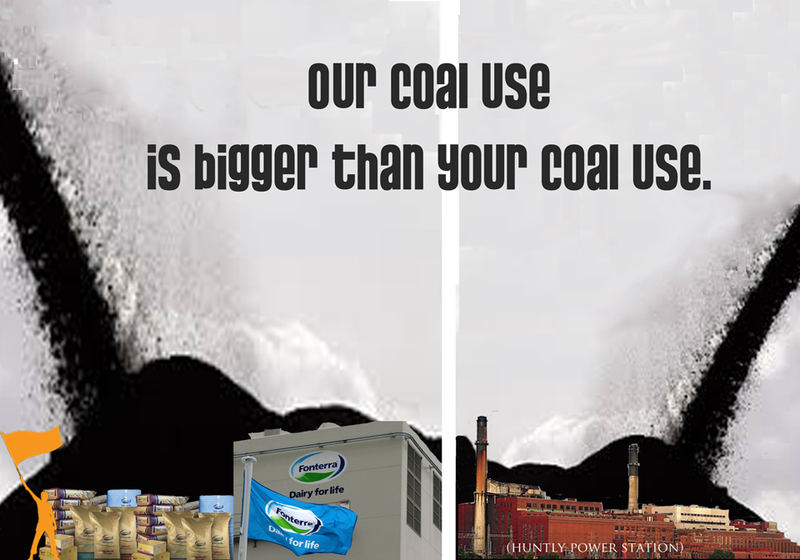 And it’s why it’s time to Tell Fonterra: No New Coal. Fonterra does not divulge its total coal burn, but this table, compiled by CANA from various mainly public sources, shows it is well over half a million tonnes a year and growing rapidly. Even without the proposed huge new coal fired milk drier at Studholme, for which Fonterra has just applied for consents, it uses more coal than the Huntly power station. With the new plant it would use more than 600,000 tonnes. The Huntly coal-fired power station has the capacity to generate 480 MW of heat, compared with Fonterra’s combined generating capacity of 572.9 MW. The largest coal user in New Zealand is the Glenbrook steel mill. The Huntly power station was second, but has now been overtaken by Fonterra. “Fonterra’s use of coal, and its planned expansion, is simply unsustainable,” said CANA spokesperson Jeanette Fitzsimons. “The world is in transition away from coal as climate change starts to bite everywhere and the science tells us we must phase out fossil fuels by 2050. Fonterra is going rapidly in the other direction”. These huge quantities of coal are used to generate heat to dry milk to milk powder, a low value commodity which is Fonterra’s main export. The company has a number of alternatives. Wood-fired boilers are common in Europe, and New Zealand has large quantities of waste wood from forestry operations. There are wood fuel suppliers who collect and process this wood and deliver to boiler sites. “Another smart strategy would be to invest in adding more value to less milk, with less coal burn and fewer cows generating more wealth for Fonterra, farmers and the country,” said Ms Fitzsimons. As the world demands action on climate change and a shift to cleaner fuels, the risk to Fonterra’s brand in discerning markets like Europe will become a serious consideration. While the world is working to move away from coal, the Government has done nothing to deter Fonterra’s use of the climate-changing fuel, testament to the fact that we have one of the weakest climate policies on the planet. CANA is a volunteer group of citizens working to reduce the mining and burning of coal by opposing new and expanded mines and plans to burn more coal, while protecting the jobs that already exist.